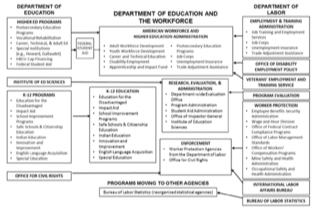 Merging ED [Education Department] and DOL [Department of Labor] would allow the Federal Government to address the educational and skill needs of American students and workers in a coordinated way, eliminating duplication of effort between the two agencies and maximizing the effectiveness of skill-building efforts. All of the existing ED and DOL programs would merge into a single department that would consist of four “sub-agencies” that focus on 1) K-12; 2) Higher Education/Workforce Development; 3) Enforcement; and 4) Research/Evaluation/Administration. The K-12 agency would support State and local educational agencies to improve the achievement of preschool, elementary, and secondary school students, including students with disabilities, Native American students, and English language learners. The new American Workforce and Higher Education Administration (AWHEA) would be charged with ensuring that American workers possess the skills necessary to succeed in the workforce. 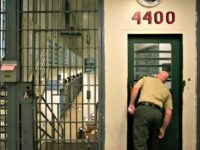 The Enforcement agency would include worker protection agencies from DOL that are responsible for enforcing statutes relating to workers’ pay, safety, benefits, and other protections, as well as Federal workers’ compensation programs. The Research, Evaluation, and Administration agency would include centralized offices focused on policy development, research, and evaluation, in addition to management-focused offices related to IT, procurement, financial management, and budgeting. The proposal to merge the two federal departments will need congressional approval, but – just in its first day of public review – the plan already has drawn criticism from those on the right and the left. A statement by Republican Rep. Virginia Foxx of North Carolina, chairwoman of the House Education Committee, echoed DeVos. 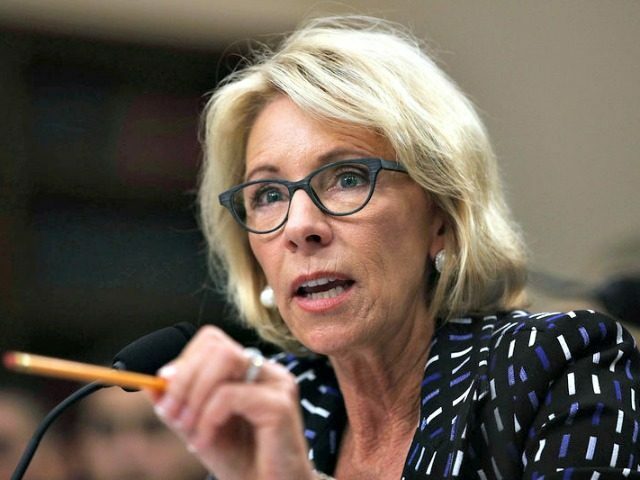 “The proposed Department of Education and the Workforce is recognition of the clear relationship between education policy at every level and the needs of the growing American workforce,” she said. It is precisely, however, because the plan creates an “education-to-career pipeline” and seeks to achieve “workforce development” as its goal that many in the conservative base of the Republican party say it is not in keeping with what Trump campaigned on in 2016. During his presidential campaign, Trump consistently told parents he would end Common Core and work to eliminate the federal Education Department, returning education policy to the states where the Constitution intended it. In an interview with Breitbart News, Eunie Smith, president of the Eagle Forum, said the administration’s proposal is mind-boggling in its apparent acceptance that it is the role of the federal government to plan the workforce. Massie said, for example, Project Head Start, the early childhood program, is part of the Department of Health and Human Services – not the Education Department. The School Lunch Program, he added, is housed at the Department of Agriculture. “I think the plan is a step in the right direction if it creates a smaller bureaucracy,” he continued, still acknowledging the validity of concerns that the proposal may not return control of education to parents and localities, or that it may further a federal role in planning the workforce. Still, Indiana parent activist and APP policy analyst Erin Tuttle told Breitbart News she does not see how the plan fulfills the president’s campaign promises on education.